When it was asked to social media-savvy organizations in India during the survey, 95.7% said they use the medium to build communities and promote usage while 76.1% use social media to highlight brand development. Around 16% of the organizations using the platform for both the above reasons use it for other purposes as well such as research, lead generation and customer service. Facebook with the maximum number of active users happens to be the most important platform for marketers in India, followed by Twitter, YouTube and blogging. When it was asked to the social media-savvy organizations in India, half of them said they are already using some of the emerging platforms such as Google+, Pinterest and Foursquare. More than half of them said they regularly engage with bloggers or influencers who have authority and strong fan following. Around 87.5% of social media-savvy organizations in India have carried out campaigns where social media is the leading component and more than half of the organizations surveyed used social media to accelerate processes or enable special benefits for online fans. Majority of social media-savvy organizations drive engagement by generic content, rather than branded content however they post multiple updates a day. As far as responding to the queries are concerned , majority of them do it within 30 to 60 minutes on Twitter while they take around 30 minutes to a few hours on Facebook for the same. Contests or promotions are popular too, especially pictorial contests; featuring once a month. Although majority of surveyed organizations in India follow certain guidelines in order to carry out social media campaign effectively still less than half of them have crisis manuals. But they of course use tools to for online monitoring, response management, or managing social media platforms. Almost half of the organizations have carried out research using social media tools in order to get customer feedback and know more about customer behavior. Besides, 50% of the organizations have created mobile phone apps, with another 25% planning to do so. The majority of organizations that use social media competently use social ads to promote online campaigns and brand awareness, and find them beneficial. 83% of them said they have used social media ads and mainly to promote a contest/promotion or generate brand awareness. 88.6% of them said that social media helped them in achieving those objectives. Majority of social media-savvy organizations in India i.e. 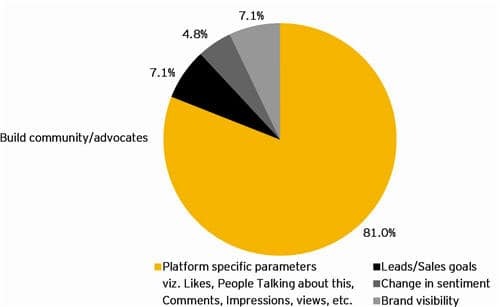 of the organization surveyed 86% make use of platform-specific parameters such as likes, views and so on to measure their social media success. However, 46.7% said they don’t measure revenue from their social media efforts. Remarkably, there are a few organizations that measure social media success through leads, brand visibility, response and have seen augmentation in revenue from social media efforts. Although 3/4th of the organizations surveyed have their social media budget below INR10 million, 41.5% of the organizations said that around 1%-5% of their marketing budget in spent on social media. A little over 25% of the organizations surveyed have social media budgets exceeding INR20 million. • 70.2% said they have an in house social media expert in middle management. Majority of social media-savvy organizations in India find the future of social media to be really promising. 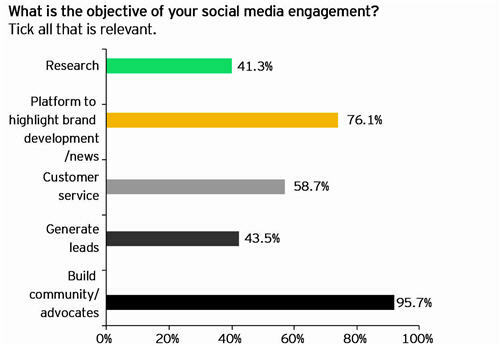 They are quite optimistic about the role of social media in their organizations. Although, not every organization is able to measure social media success through leads or sales but still they think that it plays a significant role in generating insights and engaging with customers constantly. They are able to create their own communities of fans, customers and prospects with the help of social media. In the future, organizations are planning to pay more attention towards social media.